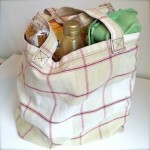 Find details of my my jargon-free, simple-to-make bag patterns below. 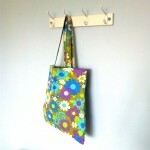 I hope to add more practical sewing patterns to my range in due course. Don’t forget to check out my free sewing patterns and complete sewing kits too. I also blog about quick sewing projects that don’t need a whole pattern, such as how to make a child’s nightdress out of an adult t-shirt. You’ll also often find pictures of quick sewing projects and visible mending on my Instagram. You can make yourself some endlessly useful bags even if you’ve never sewn anything before, with my easy sewing patterns. The bags in these pictures have been in constant use in my own household for years, so the payback for your effort will be immense! Click on one of the images to see more details on Etsy or to download the pattern. My patterns contain full details on sourcing and recycling second-hand fabric from old clothes, bedlinen, etc, so no expensive fabric is necessary. You don’t even need a sewing machine if you are using a lightweight fabric!